Tailoring Twitter: Get Busy Folks to “Get” Twitter in 2 Minutes Flat! Last I worked the social media station for McGraw-Hill Education at the National Conference of Teachers of Mathematics, a gathering of about 9,000 attendees. As it happens this attendee group is math teachers, school superintendents, math tutors, and people who build products for, consult with, and sell products to the education industry. Every administrator, every teacher, every editor, designer, consultant, sales rep, and presenter I spoke with has a huge job — days filled with helping others gain expertise and find knowledge, breaks and evenings filled with planning how to do that more effectively. Sounds a lot like every client, customer, web publisher, manager, and business person I know. I bet you know a few people like that too. Here’s how I was able to change that view for over 90% of the folks with whom I spoke in less than 2 Minutes Flat! How to Get Busy Folks to “Get” Twitter in 2 Minutes Flat! My purpose for being at the event was to show every version of busy people how Twitter can make their jobs easier, faster, and more meaningful. Naturally, I’d start by asking questions and listening. The conversation would go something like this. Here’s two activities for the classroom. Here’s an article on how a teacher made Calculus the most popular class in the school. Look at that! There’s an event for middle school teachers in your state next month. Yesterday I saw a tweet from a teacher who was looking for a video on nanotechnology for his students. And did you see the Tweet right there, where @mheducation is offering their Math Apps for free during this conference? . So you don’t feel alone. To ask questions and get answers. To get insights and best practices. 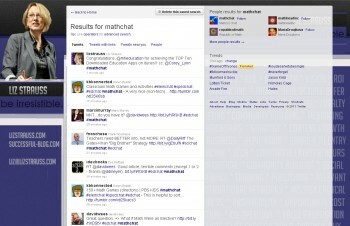 To connect with math people all over the world. 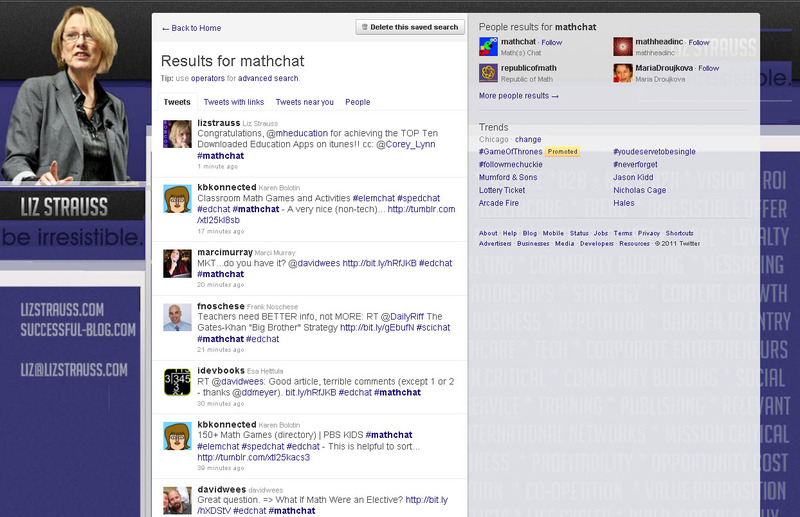 The other things that’s really cool is that every week for one hour math people from all over the world meet at the same time under this #mathchat hashtag to talk math in real time — it’s like a mini math conference every week online — you can just listen in or talk and make friends who do what you do. That’s when I handed them a sheet with the information from these two blog posts. Tailoring Twitter: Does Your Twitter Profile Attract the Right People? and some information on how to find a list of the most popular hashtags in their industry. Now you see how a single hashtag can get right to the deep value of Twitter for almost anyone one. How can you use this to tailor Twitter — to make it faster, easier and more meaning — for the folks you know? Sometimes you have to be in the situation to figure out what works. It was crazy how it came to me just so! Great blog post, Liz. I used to think that Twitter was just naturally relevant for some people and less relevant for others. That not the case. It’s a great tool for anyone — it’s one of the most flexible and accessible social media tools out there. I’ve always thought of Twitter as paper an pencil, but convincing others that it was that useful took some thinking. I’m delighted to have found an easy way to do that. YeA! Thanks for this Liz. I used this strategy for one client and they were absolutely amazed at what was going on on Twitter. Once you find their value trigger, signing them up is the easy part. If they’re looking for ideas or answers or if they just don’t want to feel so alone, Twitter can be a place to get what they need easily and without the cumbersome constant interruption of other social sites. “dip in / step out” is what I say. This is just too easy, you have just saved me hours of pulling my hair out trying to get our store managers to engage with their customers outside of the store. Thanks I owe you one. Like to borrow your brain for 1 Day-That is some GOOD Stuff!! Really great advice! I love how you condensed the benefits of Twitter down to two minutes.